Mount Harvard is the highest of the Collegiate Peaks and the third-highest peak of the Rocky Mountains. Blanca Peak is the highest peak of the Sangre de Cristo Mountains and the fifth-highest peak of the Rocky Mountains. Uncompahgre Peak is the highest peak of the San Juan Mountains and the sixth-highest peak of the Rocky Mountains. 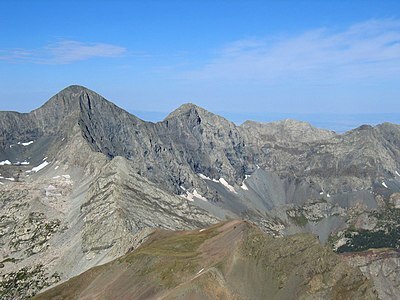 Crestone Peak is the highest peak of the Crestones and the seventh-highest peak of the Rocky Mountains. 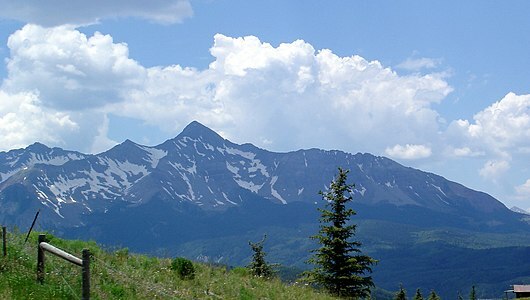 Mount Lincoln is the highest peak of the Mosquito Range and the eighth-highest peak of the Rocky Mountains. 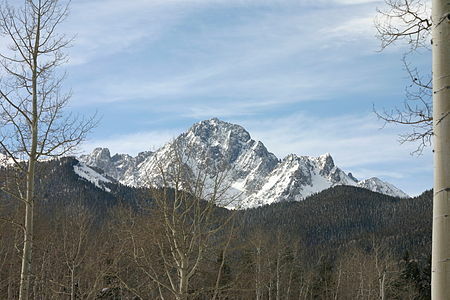 Castle Peak is the highest peak of the Elk Mountains and the ninth-highest peak of the Rocky Mountains. 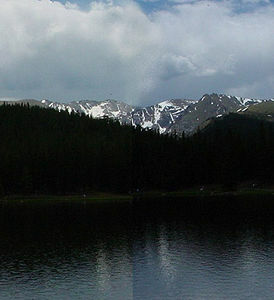 Grays Peak is the highest peak of the Front Range and the tenth-highest peak of the Rocky Mountains. 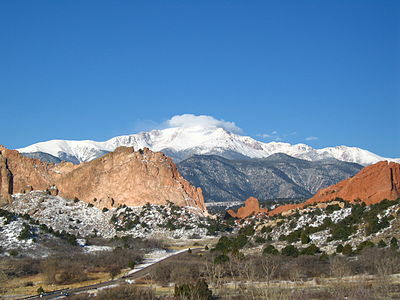 Pikes Peak is the highest peak of the Southern Front Range. The mountain was the inspiration for "America the Beautiful". ^ "Sawatch Range". Mountain Ranges of the World. peakbagger.com. Retrieved September 26, 2014. ^ The place name "Sawatch" is pronounced /səˈwætʃ/. This name derives from the Ute language noun "sawup" /səˈwʌp/, meaning "sand dunes". The Spanish language version of this name is usually spelled "Saguache", while the English language version is usually spelled "Sawatch". ^ The summit of Mount Elbert is the highest point of the Rocky Mountains, the State of Colorado, and Lake County. ^ "Mount Elbert". Datasheet for NGS Station KL0637. U.S. National Geodetic Survey. Retrieved September 23, 2014. 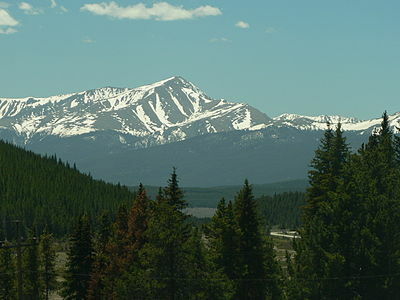 ^ The elevation of Mount Elbert includes an adjustment of + m (6.55 ft) from NGVD 29 to NAVD 88. ^ "Mount Elbert". Peakbagger.com. Retrieved September 23, 2014. ^ Mount Massive is the second highest peak of the Rocky Mountains..
^ "Mount Massive". Datasheet for NGS Station KL0640. U.S. National Geodetic Survey. Retrieved September 24, 2014. ^ "Mount Massive". Peakbagger.com. Retrieved September 24, 2014. ^ The summit of Mount Harvard is the highest point of the Collegiate Peaks and Chaffee County, Colorado. ^ "Mount Harvard". Datasheet for NGS Station JL0879. U.S. National Geodetic Survey. Retrieved September 23, 2014. ^ The elevation of Mount Harvard includes an adjustment of + m (6.84 ft) from NGVD 29 to NAVD 88. ^ "Mount Harvard". Peakbagger.com. Retrieved September 23, 2014. ^ "Williams Mountains". Mountain Ranges of the World. peakbagger.com. Retrieved March 9, 2012. ^ "Bill Williams Peak". Peakbagger.com. Retrieved September 24, 2014. ^ "Mount Antero". Datasheet for NGS Station JL0883. U.S. National Geodetic Survey. Retrieved September 23, 2014. ^ The elevation of Mount Antero includes an adjustment of + m (6.79 ft) from NGVD 29 to NAVD 88. ^ "Mount Antero". Peakbagger.com. Retrieved September 23, 2014. ^ "Mount Ouray". Datasheet for NGS Station JL0672. U.S. National Geodetic Survey. Retrieved September 23, 2014. ^ The elevation of Mount Ouray includes an adjustment of + m (6.14 ft) from NGVD 29 to NAVD 88. ^ "Mount Ouray". Peakbagger.com. Retrieved September 23, 2014. 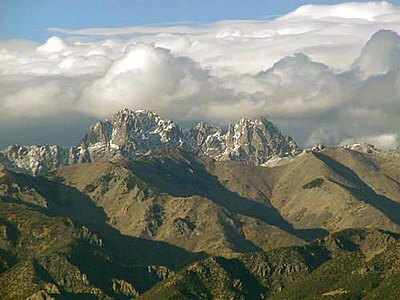 ^ The summit of Mount of the Holy Cross is the highest point of the northern Sawatch Range and Eagle County, Colorado. ^ "MT HOLY CROSS ET". Datasheet for NGS Station KL0649. U.S. National Geodetic Survey. Retrieved October 7, 2014. 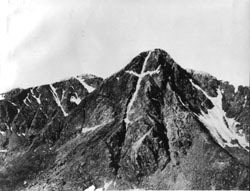 ^ The elevation of Mount of the Holy Cross includes an adjustment of + m (6.32 ft) from NGVD 29 to NAVD 88. ^ "Mount of the Holy Cross". Peakbagger.com. Retrieved October 7, 2014. ^ The summit of Blanca Peak is the highest point of the Sierra Blanca Massif, the Sangre de Cristo Mountains, Alamosa County and Costilla County, Colorado. 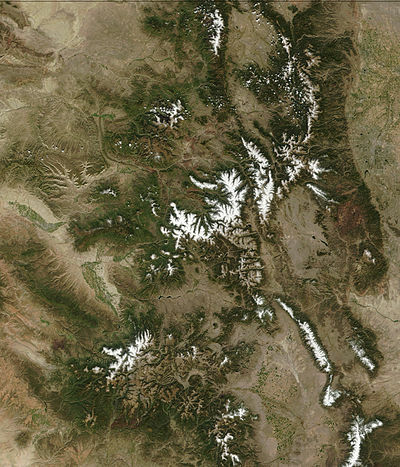 ^ The elevation of Blanca Peak includes an adjustment of + m (5.76 ft) from NGVD 29 to NAVD 88. ^ "Blanca Peak". Peakbagger.com. Retrieved September 23, 2014. ^ The summit of Crestone Peak is the highest point of the northern Sangre de Cristo Mountains and Saguache County, Colorado. ^ "Crestone Peak". Peakbagger.com. Retrieved September 23, 2014. ^ "Rito Alto Peak". Datasheet for NGS Station JK1300. U.S. National Geodetic Survey. Retrieved September 29, 2014. ^ "Rito Alto Peak". Peakbagger.com. Retrieved September 29, 2014. ^ "Culebra Peak". Peakbagger.com. Retrieved September 23, 2014. 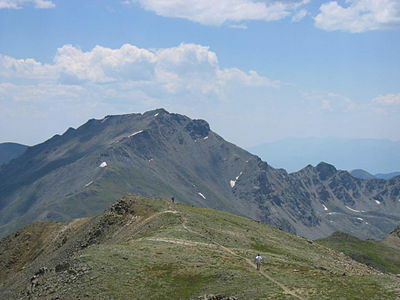 ^ The summit of West Spanish Peak is the highest point of Las Animas County, Colorado. 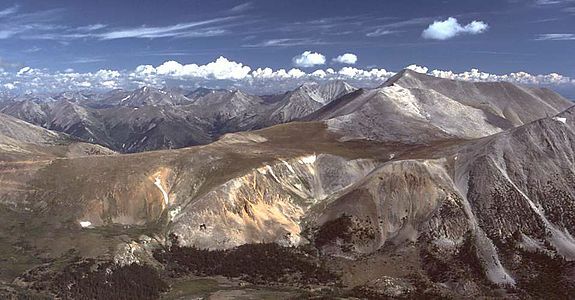 ^ West Spanish Peak is the easternmost 13,000-foot (4,000 m) summit of the United States..
^ "West Spanish Peak". Peakbagger.com. Retrieved September 24, 2014. ^ The summit of Greenhorn Mountain is the highest point of the Wet Mountains and Pueblo County, Colorado. ^ "Greenhorn Mountain". Datasheet for NGS Station HK0512. U.S. National Geodetic Survey. Retrieved September 23, 2014. ^ "Greenhorn Mountain". Peakbagger.com. Retrieved September 23, 2014. ^ The summit of Uncompahgre Peak is the highest point of the San Juan Mountains and Hinsdale County, Colorado. ^ "Uncompahgre Peak". Datasheet for NGS Station JL0798. U.S. National Geodetic Survey. Retrieved September 23, 2014. ^ The elevation of Uncompahgre Peak includes an adjustment of + m (6.45 ft) from NGVD 29 to NAVD 88. ^ "Uncompahgre Peak". Peakbagger.com. Retrieved September 23, 2014. ^ The summit of Mount Wilson is the highest point of the San Miguel Mountains and Dolores County, Colorado. ^ "Mount Wilson". Peakbagger.com. Retrieved September 23, 2014. ^ The summit of Mount Sneffels is the highest point of the Sneffels Range and Ouray County, Colorado. ^ "Mount Sneffels". Datasheet for NGS Station JL0826. U.S. National Geodetic Survey. Retrieved September 23, 2014. ^ The elevation of Mount Sneffels includes an adjustment of + m (6.16 ft) from NGVD 29 to NAVD 88. ^ "Mount Sneffels". Peakbagger.com. Retrieved September 23, 2014. ^ "Needle Mountains". Mountain Ranges of the World. peakbagger.com. Retrieved March 9, 2012. 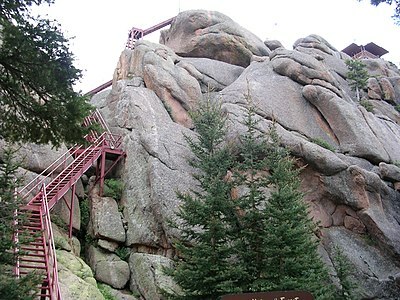 ^ The summit of Windom Peak is the highest point of the Needle Mountains and La Plata County, Colorado. ^ Mount Eolus may be higher than Windom Peak..
^ "Windom Peak". Peakbagger.com. Retrieved September 25, 2014. ^ "Vestal Peak". Peakbagger.com. Retrieved September 26, 2014. ^ The summit of Twilight Peak is the highest point of the West Needle Mountains. ^ The elevation of Twilight Peak includes an adjustment of + m (5.04 ft) from NGVD 29 to NAVD 88. ^ "Twilight Peak". Peakbagger.com. Retrieved September 24, 2014. ^ "San Luis Peak". Datasheet for NGS Station HL0570. U.S. National Geodetic Survey. Retrieved September 23, 2014. ^ The elevation of San Luis Peak includes an adjustment of + m (6.88 ft) from NGVD 29 to NAVD 88. ^ "San Luis Peak". Peakbagger.com. Retrieved September 23, 2014. ^ The summit of Long Branch Baldy is the highest point of the Cochetopa Hills. ^ "Long Branch Baldy". Datasheet for NGS Station JL0682. U.S. National Geodetic Survey. Retrieved September 26, 2014. ^ The elevation of Long Branch Baldy includes an adjustment of + m (6.1 ft) from NGVD 29 to NAVD 88. ^ "Long Branch Baldy". Peakbagger.com. Retrieved September 26, 2014. ^ The summit of Half Peak is the highest point of the east central San Juan Mountains. ^ "Half Peak". Peakbagger.com. Retrieved September 26, 2014. ^ The summit of Summit Peak is the highest point of the southern San Juan Mountains and Archuleta County, Colorado. ^ "SUMMIT". Datasheet for NGS Station HL0503. U.S. National Geodetic Survey. Retrieved October 7, 2014. ^ The summit elevation of Summit Peak includes a vertical offset of m (-0.5 ft) from the station benchmark. ^ The elevation of Summit Peak includes an adjustment of + m (6.16 ft) from NGVD 29 to NAVD 88. ^ "Summit Peak". Peakbagger.com. Retrieved October 7, 2014. 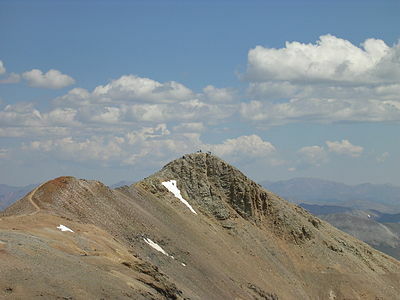 ^ The summit of Hesperus Mountain is the highest point of the La Plata Mountains and Montezuma County, Colorado. ^ "Hesperus Mountain". Peakbagger.com. Retrieved September 23, 2014. ^ The summit of Mount Lincoln is the highest point of the Mosquito Range and Park County, Colorado. ^ "Mount Lincoln". Datasheet for NGS Station KL0627. U.S. National Geodetic Survey. Retrieved September 23, 2014. ^ The elevation of Mount Lincoln includes an adjustment of + m (6.88 ft) from NGVD 29 to NAVD 88. ^ "Mount Lincoln". Peakbagger.com. Retrieved September 23, 2014. ^ "Quandary Peak". Datasheet for NGS Station KL0622. U.S. National Geodetic Survey. Retrieved September 25, 2014. ^ "Quandary Peak". Peakbagger.com. Retrieved September 25, 2014. ^ The summit of Grays Peak is the highest point of the Front Range, the Continental Divide of North America, Clear Creek County and Summit County, Colorado. ^ "Grays Peak". Datasheet for NGS Station KK2036. U.S. National Geodetic Survey. Retrieved September 24, 2014. 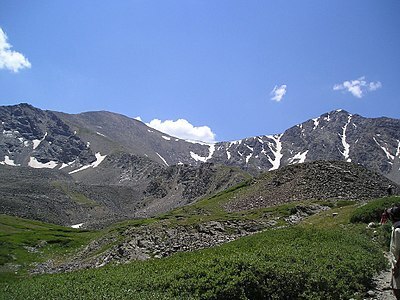 ^ The elevation of Grays Peak includes an adjustment of + m (6.17 ft) from NGVD 29 to NAVD 88. ^ "Grays Peak". Peakbagger.com. Retrieved September 24, 2014. ^ "EVANS". Datasheet for NGS Station KK2030. U.S. National Geodetic Survey. Retrieved October 7, 2014. ^ The elevation of Mount Evans includes an adjustment of + m (5.99 ft) from NGVD 29 to NAVD 88. ^ "Mount Evans". Peakbagger.com. Retrieved October 7, 2014. ^ "Twin Peaks Massif". Mountain Ranges of the World. peakbagger.com. Retrieved March 9, 2012. ^ The summit of Longs Peak is the highest point of the northern Front Range, Rocky Mountain National Park, and Boulder County, Colorado. ^ "Longs Peak". Datasheet for NGS Station LL1346. U.S. National Geodetic Survey. Retrieved September 23, 2014. ^ The elevation of Longs Peak includes an adjustment of + m (5.42 ft) from NGVD 29 to NAVD 88. ^ "Longs Peak". Peakbagger.com. Retrieved September 23, 2014. ^ The summit of Hagues Peak is the highest point of the Mummy Range and Larimer County, Colorado. ^ "Hagues Peak". Datasheet for NGS Station LL1350. U.S. National Geodetic Survey. Retrieved September 23, 2014. ^ The elevation of Hagues Peak includes an adjustment of + m (5.64 ft) from NGVD 29 to NAVD 88. ^ "Hagues Peak". Peakbagger.com. Retrieved September 23, 2014. ^ "North Arapaho Peak". Datasheet for NGS Station LL1357. U.S. National Geodetic Survey. Retrieved September 23, 2014. ^ "North Arapaho Peak". Peakbagger.com. Retrieved September 23, 2014. ^ "Mount Richthofen". Peakbagger.com. Retrieved September 24, 2014. ^ The summit of Pikes Peak is the highest point of the southern Front Range and El Paso County, Colorado. ^ Pikes Peak is the easternmost 14,000-foot (4,300 m) summit of the United States. Pikes Peak was the inspiration for the lyrics of America the Beautiful..
^ "Pikes Peak". Datasheet for NGS Station JK1242. U.S. National Geodetic Survey. Retrieved September 23, 2014. ^ The elevation of Pikes Peak includes an adjustment of + m (5.51 ft) from NGVD 29 to NAVD 88. ^ "Pikes Peak". Peakbagger.com. Retrieved September 23, 2014. ^ "Ptarmigan Peak". Peakbagger.com. Retrieved September 26, 2014. ^ "Knobby Crest". Peakbagger.com. Retrieved September 24, 2014. ^ "Bison Peak". Datasheet for NGS Station KK1966. U.S. National Geodetic Survey. Retrieved September 24, 2014. ^ The elevation of Bison Peak includes an adjustment of + m (5.32 ft) from NGVD 29 to NAVD 88. ^ "Bison Peak". Peakbagger.com. Retrieved September 24, 2014. ^ "Waugh Mountain". Peakbagger.com. Retrieved September 24, 2014. ^ The summit of Thunder Butte is the highest point of Douglas County, Colorado. ^ "Thunder Butte". Datasheet for NGS Station KK1953. U.S. National Geodetic Survey. Retrieved September 23, 2014. ^ The elevation of Thunder Butte includes an adjustment of + m (3.99 ft) from NGVD 29 to NAVD 88. ^ "Thunder Butte". Peakbagger.com. Retrieved September 23, 2014. ^ The summit of Castle Peak is the highest point of the Elk Mountains, Gunnison County and Pitkin County, Colorado. ^ "Castle Peak". Datasheet for NGS Station KL0659. U.S. National Geodetic Survey. Retrieved September 23, 2014. ^ The elevation of Castle Peak includes an adjustment of + m (7.1 ft) from NGVD 29 to NAVD 88. ^ "Castle Peak". Peakbagger.com. Retrieved September 23, 2014. ^ "Mount Owen". Datasheet for NGS Station JL0737. U.S. National Geodetic Survey. Retrieved September 26, 2014. ^ "Mount Owen". Peakbagger.com. Retrieved September 26, 2014. ^ "West Elk Peak". Datasheet for NGS Station JL0755. U.S. National Geodetic Survey. Retrieved September 24, 2014. ^ "West Elk Peak". Peakbagger.com. Retrieved September 24, 2014. ^ "Mount Powell". Peakbagger.com. Retrieved September 24, 2014. ^ The summit of Clark Peak is the highest point of the Medicine Bow Mountains and Jackson County, Colorado. ^ "CLARK". Datasheet for NGS Station LL1388. U.S. National Geodetic Survey. Retrieved October 7, 2014. ^ The summit elevation of Clark Peak includes a vertical offset of + m (6 ft) from the station benchmark. ^ "Clark Peak". Peakbagger.com. Retrieved October 7, 2014. ^ "Flat Tops". Mountain Ranges of the World. peakbagger.com. Retrieved September 26, 2014. ^ The summit of Flat Top Mountain is the highest point of the Flat Tops and Garfield County, Colorado. ^ "Flat Top Mountain". Datasheet for NGS Station LM0694. U.S. National Geodetic Survey. Retrieved September 24, 2014. ^ The elevation of Flat Top Mountain includes an adjustment of + m (5.57 ft) from NGVD 29 to NAVD 88. ^ "Flat Top Mountain". Peakbagger.com. Retrieved September 24, 2014. ^ "Parkview Mountain". Datasheet for NGS Station LM0574. U.S. National Geodetic Survey. Retrieved September 24, 2014. ^ "Parkview Mountain". Peakbagger.com. Retrieved September 24, 2014. 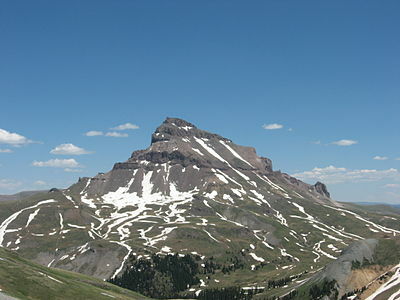 ^ The summit of Mount Zirkel is the highest point of the Park Range and Routt County, Colorado. ^ The elevation of Mount Zirkel includes an adjustment of + m (5.35 ft) from NGVD 29 to NAVD 88. ^ "Mount Zirkel". Peakbagger.com. Retrieved September 23, 2014. ^ The elevation of Sand Mountain North includes an adjustment of + m (4.93 ft) from NGVD 29 to NAVD 88. ^ "Sand Mountain North". Peakbagger.com. Retrieved September 24, 2014. ^ "Blair Mountain". Peakbagger.com. Retrieved September 24, 2014. ^ "Crater Peak". Datasheet for NGS Station KL0706. U.S. National Geodetic Survey. Retrieved September 24, 2014. ^ "Crater Peak". Peakbagger.com. Retrieved September 24, 2014. ^ "SOUTH BALD". Datasheet for NGS Station LL1377. U.S. National Geodetic Survey. Retrieved October 7, 2014. ^ The summit elevation of South Bald Mountain includes a vertical offset of + m (2 ft) from the station benchmark. ^ The elevation of South Bald Mountain includes an adjustment of + m (4.67 ft) from NGVD 29 to NAVD 88. ^ "South Bald Mountain". Peakbagger.com. Retrieved October 7, 2014. ^ "Uncompaghre Plateau". Mountain Ranges of the World. peakbagger.com. Retrieved March 9, 2012. ^ "Horsefly Peak". Datasheet for NGS Station JL0830. U.S. National Geodetic Survey. Retrieved September 26, 2014. ^ "Horsefly Peak". Peakbagger.com. Retrieved September 26, 2014. ^ "Ute Peak". Datasheet for NGS Station HM0511. U.S. National Geodetic Survey. Retrieved September 24, 2014. ^ "Ute Peak". Peakbagger.com. Retrieved September 24, 2014. ^ The summit of Fishers Peak is the highest point of Raton Mesa. ^ Fishers Peak is the easternmost 9,600-foot (2,900 m) summit of the United States..
^ "Fishers Peak". Datasheet for NGS Station HK0441. U.S. National Geodetic Survey. Retrieved September 24, 2014. ^ The elevation of Fishers Peak includes an adjustment of + m (3.76 ft) from NGVD 29 to NAVD 88. ^ "Fishers Peak". Peakbagger.com. Retrieved September 24, 2014.